Mangaluru, June 07 2017: It is reported that the Karnataka Rakshana Vedike (KRV) under the leadership of Praveen Shetty has decided to hold a border bandh protest by blocking the Karnataka – Kerala National Highway at Talapady on June 8.The protest planned is against the Kerala government’s decision to make Malayalam mandatory in schools in Kasargod district. 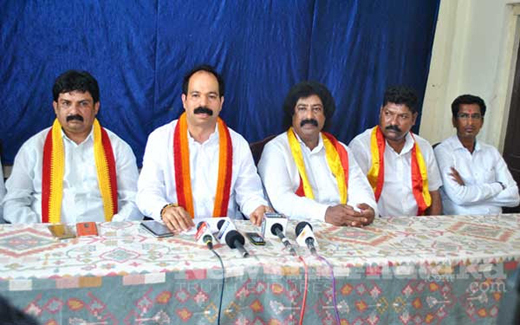 Disclosing the details at a press conference in the city, KRV state President Praveen Kumar Shetty, said ‘activists supported by several like-minded organisations will hold vehicle rallies and hold the protest at Talapady town bordering Karnataka – Kerala. Similar protest Rallies have been planned across DK and Udupi districts on the same day, confirmed Praveen Shetty and added Vedike has called for a state-wide bandh in Karnataka on June 12 from 6am to 6pm to protest against state government’s inaction with regard to several issues. They include Kalasa-Banduri, Mekedatu projects and on the problems dogging farmers in the state. Where Kannada Chaluvali leader Vatal Nagaraj and noted Kannada activist Sa Ra Govind will lead the protestors, Praveen Shetty stated. Kerala government’s decision to make Malayalam mandatory in Kannada medium schools is a violation of a trilingual policy adopted 48 years ago, said K Bhaskara, Kannada activist from Kasargod. The decision will affect over 46,000 students studying in Kannada medium in 189 schools in Kasargod. Out of 189 schools, 84 are completely Kannada medium while the remaining have classes in Malayalam medium too. The border bandh protest is fourth in line after 10,000 activists picketed the Kasargod District Collectorate entrances, preventing employees from entering the offices followed by picketing taluk level offices at Kasaragod and Manjeshwar. A day long hunger strike to protest the Kerala government’s decision too was organised. Several Kannada activists, school teachers, parents and students had taken part on those occasions.